Dolmens are stone constructions, built in the 4th – 2nd millennium BC (there are different dates suggested), nobody knows by whom or what for. These are constructions made of massive sandstone platforms. They are cavated in rocks, usually having a portal (a doorway). 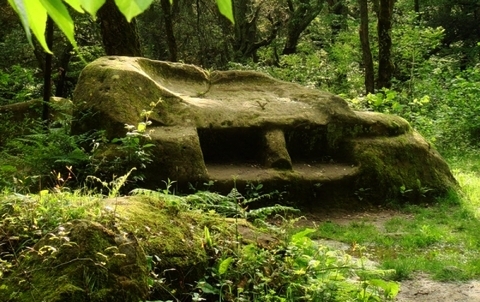 Dolmens are variously shaped: rectangular, round, trapezium-shaped. There are, totally, about 2500 dolmens, mainly in the Caucasus, partly ruined, some of them in the distanced areas, and there is a number of them not far from resort areas. Unfortunately, nobody investigated the dolmens before 1950s, so many dolmens were taken to pieces by the locals. Many dolmens are still not protected by the government. People get different emotions from the dolmens. It depends on the aim you have, your imagination, mood, whether you know yourself or not. For many people dolmens are places of power where dreams come true and answers to their questions are given. Sometimes you get an answer not the question you ask, but the one you may keep deep inside, the one that is really more important. It is necessary to answer those torturing questions anyway. In dolmens, though not in any of them, you get some feeling of lightness, piece. It’s up to you to decide whether you believe in some energy existing in dolmens or not..
An exemplary plan of the expedition: visiting dolmen settlements and local caves.